Fried Corn Graduates to "Pan-Roasted," and Ooooh, La La! I'm just figuring out how much I like corn, even though parents and a perceptive daughter-in-law have formed an unbroken chain of cornophilia spanning my entire life. To be honest, I took corn for granted, until recently. "Fried" corn filled lots of bowls on lots of tables as I grew up, without attracting my interest. Things started to change a few years ago during our family's annual summer trek to the homeland (actually the homebeach) of my fine man and his family. One night, handsome chef-son (one of them) prepared a skillet of Massachusetts "Butter and Sugar" corn, zinging it up with onions and peppers and who knows what. This fried corn (or it may have been "pan-roasted," which sounds so much more refined) defied my tendency to take corn for granted, and jumped onto my plate. Several times. It turns out salon.com food writer Francis Lam likes corn, too. A lot. I like Lam's guidance on how to make pan-roasted corn. He offers a process, not a specific recipe, and he suggests quite a few choice points along the way, making it easy to tailor pan-roasted (fried, skillet) corn toward what one has on hand and what flavors one has in mind. He also included a method for cutting corn from the cob that changed my lifetime habit for the very much better. I'll leave the specifics for you to discover in Lam's story. 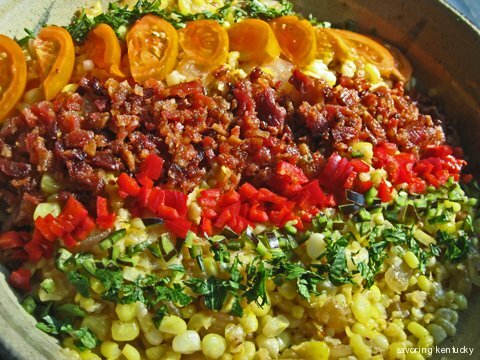 For the fried, fresh Kentucky sweet corn in the photo above, I chose classic flavor combinations: bacon from Hillside Heritage Farm, plus our own Campsie sweet orange tomatoes, hot jalapeños, and freshly chopped tarragon, mint, and parsley. Remembering that corn not only plays well with foods but famously serves as wine's best friend, I'm curious to see how this slightly dressed up old-fashioned Kentucky fried corn matches up with an array of different wines at a tasting we are attending. I'm betting it shines with an off-dry Riesling, grassy Sauvignon Blanc, buttery Chardonnay, and any light-bodied red: a Chianti or Pinot Noir, perhaps. I expect to have considerable fun testing my corn hypothesis with friends. The world is coming to visit central Kentucky this year for the Alltech FEI World Equestrian Games. To help our visitors know more about Kentucky's food and food ways, Savoring Kentucky is rolling out 116 Savory Kentucky Bites, one for each of the 100 days before WEG begins, and 16 for the days during WEG, September 25 - October 10. Today's Savory Bite is number 75. Behold the Cucumber Smoothie! Sweet Corn Add-In? Optional.